If you’re a dedicated saver and have been for most of your adult life, creating and maintaining a personal savings plan for just about any purpose is pretty easy. But if you haven’t been a saver up to this point it could be a bit more involved. On the surface, saving money should be easy. But depending on how you manage your finances, it could take several steps for you to implement a savings plan that you can and will stick to. One of the biggest reasons why people don’t save is because they don’t have a goal. Without some sort of target — a reason to save — there is no purpose. Do I want to have an emergency fund so that I don’t need to rely on credit cards when trouble strikes? Do I need to save up money for the down payment on a house? Is there a car I’d like to buy, that I want to get without having to get a loan? Do I have children I one day hope will attend college? Do I want to pay off my mortgage early so that I’m free to do other things? Is there a certain kind of retirement I hope to have one day? Do I want to retire early? Sometimes action can spring just from asking yourself the right questions. And once you do, you’ve also stated your goals. In order to reach those goals, you’ll need to take action. Once you’ve decided what it is you want to accomplish, it’s time to develop a plan to start funding those goals. That will require some sacrifice, and some rearranging. If you haven’t been a saver up to this point, you’ll have to find extra cash in your budget that you can begin using to fund your savings plans. There are different ways to do this, and you may need to use several of them. Once you come up with a workable plan to cut expenses and increase your income, you can decide how much you can afford to set aside for your savings plan. Sometimes it helps if you can jump start your savings. By banking an income tax refund, bonus check or the money from the sale of a personal asset, you can fast-forward your savings plan so that it won’t take so long for you to see results. That can provide the motivation to keep you heading in the right direction. If you like to see your money grow, there is a free software called Personal Capital that can help track your cash flow and net worth. Okay, you’ve decided what your savings goals are and how you’ll contribute toward them. The next step is deciding where to put the money you’ll be saving. What kind of savings vehicle you’ll use will depend on the purpose of the particular account. College savings for your children should be saved in either a 529 College Savings Plan or a Coverdell Education Savings Account (ESA), both of which offer tax deferral, at least on earnings. Retirement savings are best invested in a tax sheltered savings plan, such as a 401(k), 403(b), SEP, or either a Roth or traditional IRA. Retirement is a long term savings plan and will benefit from the tax-deferred status those accounts enjoy. Shorter term savings, such as emergency funds or savings earmarked for a near term event, such as a vacation or the down payment on a house, are entirely different. They should be held in a more traditional account, such as a money market fund or bank account. Access is an important consideration since the money has a specific purpose. If you plan to retire early, say at 50 or 55, you’ll want to hold some retirement assets outside a qualified plan. Generally speaking, qualified retirement plans will allow you to begin withdrawals upon attaining the age of 59 1/2. If you withdraw any funds before reaching that age, the withdrawals will not only be taxable, but you’ll also have to pay a penalty equal to 10% of the amount distributed. In order to avoid that penalty, have money saved in accounts that are not tax sheltered. Ordinary mutual funds and/or brokerage investment accounts will serve this purpose. One savings method you want to take advantage of — especially if you haven’t been a saver this far — are payroll deductions. That’s where you earmark money from your paycheck for various accounts. If you have an employer sponsored retirement plan you’re probably already doing this. Most people have their pay go directly into their checking accounts where they try to allocate it manually. But you can usually have money deposited in several accounts with different institutions. You can, for example, have money allocated between an emergency savings account, a regular savings account, a 529 savings plan, a 401(k) and your checking account. The advantage to payroll deductions is that they happen without you having to do anything. All you need to do is set the payroll allocations, then sit back and watch the various accounts build up automatically. It’s a non-savers dream! By now you have your savings goals, you’ve set up a budget, you have the proper accounts set up and, hopefully, you’re all ready to roll with your payroll deductions. There’s one other step you need to consider, and that’s having the right investment mix in your accounts. If you’re investing for long term goals, such as retirement and your children’s college education, you’ll have both the time and the need to invest more aggressively. You’ll want those funds to be invested in stocks, mutual funds and exchange traded funds (ETF’s) that are likely to provide greater returns than fixed income investments. For shorter term accounts, such as emergency savings, money for an upcoming vacation or the down payment on a house, fixed income investments are the way to go. Since you’ll need the money from those accounts within a couple of years (or even months), preserving their value will be more important than growing them. Savings accounts, money market funds, certificates of deposit or even treasury bills are perfect for this purpose. Now you have everything you need to start your own savings plan for any purpose! Have you had difficulty getting a savings plan going? JM–Do you mean setting aside bills to make room for savings? Kevin, spot on comment for Nike’s “Just Do It.” There’s never the perfect time until you make it today, now, to actually start saving. One tip I believe one can start with (for a first-timer especially) could be setting aside certain types of bills on a daily/weekly basis. No buts and ifs, just do it. Hi Cherleen–The feeling of financial security tends to rise with the size of your emergency fund, probably because it’s the account that most insulates you from immediate financial threats. Six months is pretty healthy! From the common 3-month emergency fund, we have moved to a six-month emergency fund. We are also saving up for the down payment of our second house and a bigger car. However, retiring early is not in my plans. I want to continue working as long as I can. I enjoy writing and blogging while at home. I have also started a small business to further increase our income. Similar to your recommendation, we have separate savings account for each purpose. Great plan. I’ve been using ReadyForZero to track some of my debt repayment. Then using Adaptu to stay on budget overall. Some people think of a plan as something that has to be very big. But a plan can be something as saving a few bucks a week. Even a small savings plan gets you into the habit of savings, and makes it seem possible to dream big! Hi Rohit–I think automating is the best strategy but especially for the person who has traditionally been a non-saver. It removes the savings decision, at least in the long run. Hi Kent–That’s excellent advice. It sets you up to budget for known expenses. There are usually more of those than there are emergency situations. Hi Daisy–Automatic payroll deposits are a savers dream. You build up savings without really knowing it happens. All you see are periodic savings statements, and watching the balances on those grow is a real rush! 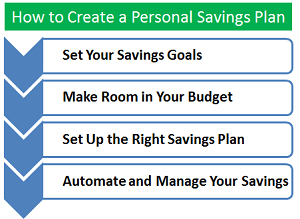 I have automatic savings that go into a variety of savings accounts for different purposes. If I didn’t have automatic savings, I don’t think I’d accumulate very quickly. Payroll deduction is also a great way to do it. I usually put a portion into a high interest account, and a portion into an easy access account just in case. Shorter term irregular needs often get in the way of long term savings. I think it is good to budget a monthly amount that goes into savings accounts for things like clothes, vacations, Holiday gifts, track the balance of each ‘account’ on a simple spread sheet, so when you need shoes for example, you know how much you have available.